Her life is a beautiful memory, Her absence is a silent grief, She is asleep in God’s beautiful garden of sunshine and perfect peace, She left a beautiful memory, a sorrow too great to be told, But to us who loved and lost her, her memory will never grow old. Helen M. Robinson Williams was born on May 24, 1941 in Bladen County, North Carolina to the late Mr. Weston Clayton and Mrs. Grace Jane Hair Robinson. Helen belonged to the Newark Church of Christ in Newark, NJ. Helen leaves to cherish her memory: her son, Rashid Sayyid “Jasper”; one grandson, Brandon Jaden Sayyid; six sisters, Mrs. Margaret R. Mosley McCullough, Fayetteville, NC, Mrs. Theressa R. Gatling, Irvington, NJ, Mrs. Lucille R. Fonsville, Fayetteville, NC, Mrs. Deborah Dantzler, Fayetteville, NC, Mrs. Loura B. Hooks, Fayetteville, NC and Ms. Rebecca I. Robinson, Raeford, NC; three brothers, Mr. Larry D. Robinson, Durham, NC, Mr. Benjamin C. Robinson, Fayetteville, NC and Mr. Henry K. Robinson, Fayetteville, NC; two sisters-in-Law, Mrs. Gretchen Robinson, Durham, NC and Mrs. Sallie D. Robinson, Fayetteville, NC; three brothers-in-Law, Mr. John F. Hammonds, Fayetteville, NC, Mr. Joe Dantzler Jr., Fayetteville, NC and Mr. Willie McCullough, Fayetteville, NC; four aunts, Mrs. Daisy H. Williams, Fayetteville, NC, Mrs. Bertha L. Ford, Fayetteville, NC, Mrs. Ella J. Avant, Fayetteville, NC and Mrs. Emma L. Hair, Fayetteville, NC; two uncles, Mr. Claxton Williams, Fayetteville, NC and Mr. Douglas Ford Sr., Fayetteville, NC; and a host of special nieces, nephews, other relatives, and friends. This Online Memorial has been created to commemorate the life of Helen M. Robinson Williams. Leave a message on the Tribute Wall to share your favorite memories and offer words of sympathy and comfort. To send flowers or a remembrance gift to the family of Helen M. Robinson Williams, please visit our Tribute Store. 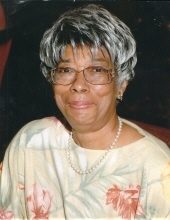 "Email Address" would like to share the life celebration of Helen M. Robinson Williams. Click on the "link" to go to share a favorite memory or leave a condolence message for the family.